Happy Family Brands sent me several complimentary product coupons and products for Baby J to try out. Shazi Visram founded the Happy Family organic food brand on Mother’s Day, 2006. After watching the struggles of a friend to feed her baby healthy but convenient foods, Visram’s Happy Family idea was conceived and launched. The brand first began with Happy Baby, but has grown since then into a line of family products for babies, toddlers, kids, and adults too. Read about their commitment to sustainability HERE. When you purchase a Happy Family product, a starving child in Africa is fed through Project Peanut Butter, a program supported by UNICEF, the WHO, and Doctors without Borders. Happy Family is also working with the FEED project. I love the Happy Baby and Happy Tot food pouches! Don’t get me wrong, I also love reusable food pouches, but the downside of those is they have to be refrigerated. You can’t just toss a reusable pouch with apple sauce or food purees into the diaper bag and be on your merry way; you have to lug around a cooler. Although prepackaged food pouches aren’t the least expensive baby food option, they’re very convenient to keep on hand, so I often do. I like to keep a pouch in the diaper bag, in case I can’t get home as quickly as I expect. The ingredients in all of the Happy Family foods that we’ve tried make me happy! When Baby J was first learning to chew, I would buy Happy Puffs for him. I liked that they were organic and sweetened with apple juice concentrate instead of added sugar. Using one of the Happy Family coupons, I purchased a package of the Happy Yogis. I don’t remember these being on the shelf when Baby J first started solids, but they would have been perfect. These yogurt and fruit snacks literally melt in your mouth. I’ve always found most baby foods to be bland, but that’s not the case with Happy Family. Here are some of their Happy Baby “Homestyle Meals” flavors: basmati rice, coconut milk, and carrot blend; turkey, veggies, and quinoa; amaranth ratatouille; and wild Alaskan salmon, quinoa, corn, and pea. 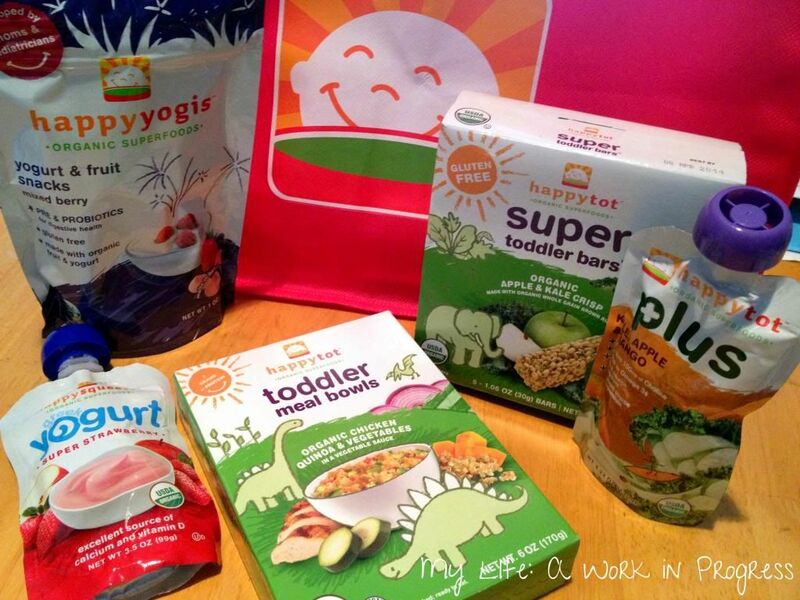 Baby J loves everything he’s tried so far: food and yogurt pouches (he practically inhales them), Happy Yogis, Happy Puffs, and the Super Toddler bars. I actually have to hide them, because he’ll freak out and want all of them, if he sees them! That’s a Super Toddler Bar crumb on the left side of his mouth and the wrapper by his left foot. Yeah…not kidding that he loves this brand. If you haven’t tried the Happy Family brand, look for it at stores near you. Our local grocery store only has a small selection of the Happy Tot and Happy Baby products, but our local Target has a great selection. Note: I received complimentary products and manufacturer’s coupons to facilitate this review. I was not otherwise compensated for this post. Your little one is adorable! And it looks like he LOVES these! We love the Happy Family brands – I love that they do not use artificial sweeteners! Oh I have not heard of this brand but I love what I hear, thanks for all the info! I need to look for this! How cute!! I do not have any little ones anymore but I love the pouches it makes them being able to feed themselves a lot easier. He seems to love them!! I too love that their pouches don’t need to be refrigerated. Super convenient when you’re on the go! I LOVE Happy Family products! finding natural AND convenient stuff is a challenge. 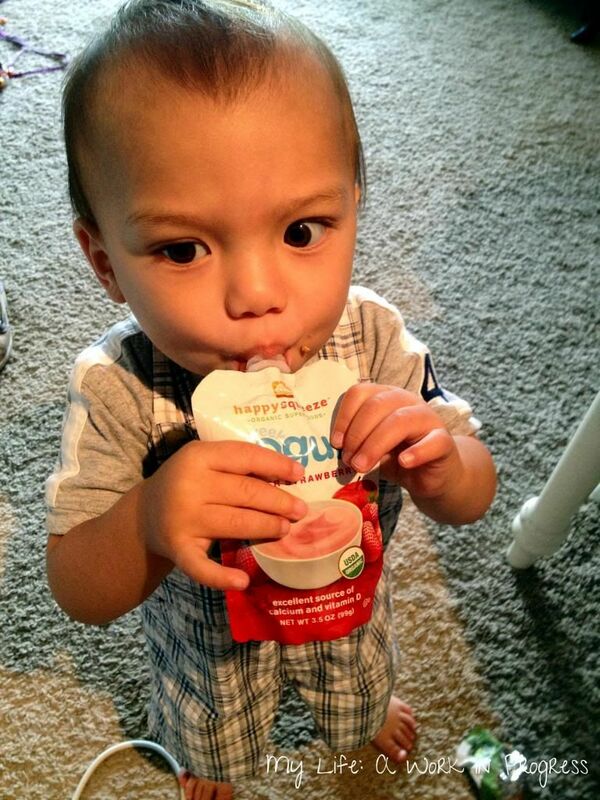 These products seem awesome and it looks like Baby J enjoyed this review too! Baby J is adorable and deserves only healthy, delicious organic foods like these! this is a great topic for me since I am doing the 30 Days Experiment this month on getting my family eating healthier. Please check it out. Hi Kim, thanks for commenting. Yes, I’ll check it out!